For more news on the reactions to the national walkout — and our continuing reporting on gun deaths and injuries at schools across the country — sign up for The 74 Newsletter. 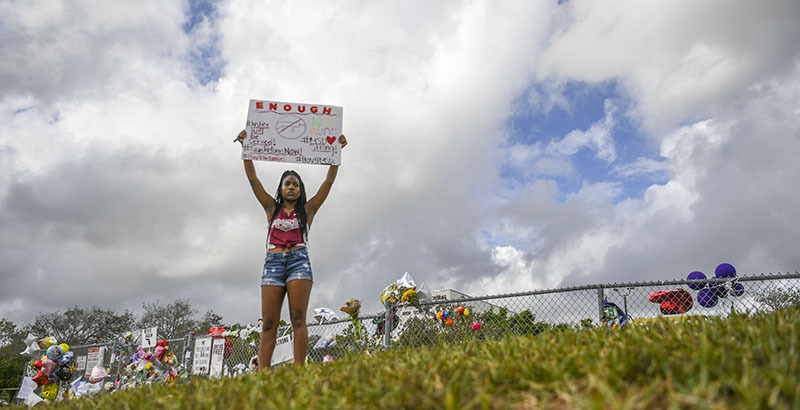 Exactly one month after 17 people were killed in a school shooting at Marjory Stoneman Douglas High School in Parkland, Florida, students across America walked out of their schools to honor those killed and to protest gun violence. None her friends wanted to walk out today. They said it’s useless. "If there was just one sign, it wouldn't make much of a difference. But all these signs will make a difference." My students are too young. As the students wait till 10 am, no one is talking. No one is looking at their phones. It’s completed silence among these teenage girls.